Chopra, Aditi / Thomas, Betsy S. / Sivaraman, Karthik / Prasad, Hemanth K. / Kamath, Shoba U. Purpose: The aim of this study was to examine the effect of chlorhexidine disinfection, as a chemical method of oral hygiene practice, and subsequent use of probiotics on halitosis in children. The effects of mechanical and chemical oral hygiene practice methods on the severity of halitosis were also assessed. Materials and Methods: 208 children with organoleptic test (OLT) scores of 2 or more were randomly assigned to four groups: A: conventional oral hygiene practices (COH) including toothbrushing and flossing; B: COH + tongue scraping (TS); C: COH + TS + chlorhexidine; D: COH + TS + chlorhexidine + probiotics. OLT was performed at 1-week and 3-month follow-ups. Results: A significant and stable number of participants showed major and moderate levels of improvement in OLT scores in group D (p < 0.001). The improvement of OLT scores in group C was also significant (p < 0.001), but not stable over the follow-ups (p = 0.44). Neither significant nor stable improvements in the OLT scores were detected in groups A and B through follow-ups (p > 0.05). Conclusion: Probiotic therapy following oral disinfection with chlorhexidine may reduce the severity of halitosis over longer periods. 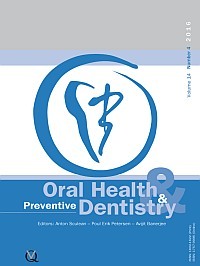 Heyman, Richard E. / Slep, Amy M. Smith / White-Ajmani, Mandi / Bulling, Lisanne / Zickgraf, Hana F. / Franklin, Martin E. / Wolff, Mark S.
Purpose: The prevalence and correlates of dental fear have been studied in representative population studies, but not in patients presenting for dental treatment. We hypothesized that dental fear among patients presenting at a large, urban college of dentistry would be similar to that of the population (e.g. 11% high dental fear, 17% to 35% moderate or higher fear) and that fear would be associated with avoidance of routine dental care, increased use of urgent dental care and poor oral health. Materials and Methods: Participants were 1070 consecutive patients at a large, urban dental care center. All patients completed a clinical interview, including demographics, medical history, dental history and presenting concerns, and behavioral health history. Patients were also asked to rate their dental anxiety/fear on a 1 (none) to 10 (high) scale. Results: Over 20% of patients reported elevated anxiety/fear, of which 12.30% reported moderate and 8.75% high fear. Severity of dental anxiety/fear was strongly related to the likelihood of avoiding dental services in the past and related to myriad presenting problems. Conclusions: As hypothesized, the prevalence of moderate or higher fear in dental patients was considerable and closely matched that found in general population surveys. Thus, the 'dental home' is an ideal location to treat clinically significant dental anxiety/fear. Purpose: To systematically examine mineralisation of healthy human enamel using Raman spectroscopy and provide an understanding of baseline variations that may be inherent in the healthy enamel from individual to individual as well as variations within a tooth. Materials and Methods: Human teeth were obtained in compliance with the NIH guidelines. The teeth were collected fresh within the date of the extraction and kept moist at all times with wet tissue paper without any additional disinfecting treatment. The samples were individually wrapped in wet tissue paper and stored in a -20°C freezer. Prior to Raman analysis, the specimens were thawed at room temperature for 30 min. A Raman microscope was employed with a 10X objective used to focus the laser light (785 nm). Raman spectroscopy scores were validated by microcomputed tomography (μCT) on the two teeth which had the highest and lowest mineralisation found in the Raman scans. Results: Mineralisation levels varied substantially between individuals. The highest Raman-based mineralisation intensity was about 5-fold greater than the lowest mineralisation score. Incisor mineralisation also varied dramatically depending on different sites on the tooth. Conclusions: Clinically applicable non-invasive techniques such as Raman spectroscopy that can quantify mineral content, such as Raman spectroscopy, may help answer whether or not mineralisation is associated with caries risk. Purpose: To compare prevalence and microbial load of six periodontal pathogens between Italian and Dutch patients affected by chronic periodontitis, using oligonucleotide probe technology. Materials and Methods: Subgingival plaque samples data from 352 Italians and 115 Dutch periodontal patients were analysed and compared. Bleeding on probing, suppuration, probing pocket depth, clinical attachment level, age, gender, ethnicities and smoking habits were recorded. Presence and level of bacterial species were determined by realtime polymerase chain reaction under the identical microbiological protocol. Statistical analysis was performed using the chi-square test, Mann-Whitney U-test and binary unconditional logistic regression (α = 0.05). Results: Between populations, only Treponema denticola and Porphyromonas gingivalis differed significantly, being more prevalent in the Italian group (p = 0.0001). Except for Tannerella forsythia, all bacterial loads differed significantly: Treponema denticola (p = 0.0001) and Prevotella intermedia (p = 0.001) were higher in Italians, while Porphyromonas gingivalis (p = 0.001), Fusobacterium nucleatum (p = 0.03) and Aggregatibacter actinomycetemcomitans (p = 0.001) were higher in Dutch patients. Conclusions: Significant differences in prevalence and bacterial load of periodontal pathogens exist between Italian and Dutch patients affected by chronic periodontitis. The microbiological profile, and particularly the bacterial load of pathogens, varied significantly between populations. Purpose: To evaluate the association of oral health-related quality of life (OHRQoL) with periodontal parameters and treatment needs in a Turkish population and compare the OHRQoL of patients with gingivitis and periodontitis. Materials and Methods: The present study had a cross-sectional design. The study population consisted of 404 patients with periodontitis (n = 130), gingivitis (n = 141) or periodontal health (n = 133). Patients' sociodemographic information as well as periodontal parameters such as plaque index (PI), bleeding on probing (BOP), probing depth (PD), clinical attachment level (CAL) and the community periodontal index of treatment needs were recorded. The impact of oral health on the patients' quality of life was assessed using the Oral Health Impact Profile-14 (OHIP-14) questionnaire. Results: The OHIP-14 scores in subjects with gingivitis and periodontitis were higher than in periodontally healthy individuals (p < 0.05). Although the total OHIP-14 scores in subjects with periodontitis were higher than those for the subjects with gingivitis, no statistically significant difference existed between the gingivitis and periodontitis groups (p > 0.05). When characterised according to periodontal treatment needs (TN), the total and individual domain OHIP-14 scores were highest in subjects at the TN3 level. The total OHIP-14 scores of subjects correlated with periodontal status, BOP, PD ≥ 4 mm (% of sites), CAL ≥ 4 mm (% of sites) and TN. Conclusions: Our results disclosed that the adverse effects on OHRQoL perceived by patients were similar in subjects with gingivitis and periodontitis. When planning treatment, it should be kept in mind that the pain and physical discomfort domains of the individual subscales are of primary importance to the patients. However, longitudinal studies are needed to clarify the relationship between periodontal status and OHRQoL. Purpose: To evaluate sealant retention in a multi-operator school-based oral health programme and sealant efficacy in preventing caries in a high caries-risk population. Materials and Methods: Sealant retention and caries status in previously placed sealants on permanent first molars were evaluated in 503 children ages 6 to 8 years at 20 primary schools. A total of 2538 sealants were applied on 876 first permanent molars and evaluated for retention and efficacy in preventing caries from 2002 to 2007. These sealants were placed on occlusal and buccal or palatal surfaces using a standard protocol after isolation with rubber-dam or cotton roll. Caries was scored in teeth in which the sealants were partially or completely lost. Result: 1752 sealants (69%) were examined at the end of the fifth year, with 58.3% of the sealants completely retained, 7.4% partially lost, 19% completely lost, 6.2% resealed and 9.1% restored. Only 3.1% of the previously sealed teeth were carious and 87.8% of previously sealed teeth were caries free. In multivariate analysis, occlusal surfaces were 2.0 times more likely to retain a sealant than were the buccal and palatal pits (p < 0.0001). No differences in sealant retention vs caries by arch, or teeth isolated using rubber-dam vs cotton roll were seen. Conclusion: The present study shows the effectiveness of sealants in caries prevention in a multi-operator school sealant programme, and provides evidence supporting their use in such programmes for high-caries populations. Sudhir, Kudlure M. / Kanupuru, Karthik K. / Fareed, Nusrath / Mahesh, Pulagam / Vandana, Kuna / Chaitra, Nelagondanahalli T.
Purpose: To evaluate CAMBRA (Caries Management by Risk Assessment) as a tool for caries risk prediction among 12- to 13-year-old institutionalised children and to validate it against the new increment of caries lesions. Materials and Methods: A longitudinal follow-up study was conducted among 72 institutionalised children. Baseline data were collected in the month of August, 2011. Children were individually interviewed to record the nonclinical information necessary to complete the CAMBRA. Clinical information for the assessment of visible plaque was recorded using the Silness and Löe plaque index and evidence of decalcification and caries was recorded using ICDAS criteria. The children underwent the follow-up examination in August 2013 to determine the new increment of dental caries. Results: 19.44% of the subjects were classified as low risk, 22.22% as moderate risk, and 58.33% as high risk for caries. The highest odds ratio (OR) for disease indicators was 7.31 for restorations in the last 3 years. The highest OR for pathological factors was 7.15 for mutans streptococci, followed by 5.54 for visible heavy plaque. The highest OR for protective factors was 0.56, i.e. a negative association of fluoride toothpaste. Among those subjects assessed as moderate and high risk for caries at baseline, 37.5% and 47.6%, respectively, had new cavities at the follow-up examination. Sensitivity for CAMBRA was found to be 47.62% with a specificity of 80%, and the area under the ROC curve was found to be 0.638. Conclusion: CAMBRA was valid and highly predictive in determining the caries risk among institutionalised children. Purpose: To evaluate the quality of patient-oriented online information about dental caries using existing consumer evaluation tools and to judge the efficacy of these tools in quality assessment. Materials and Methods: The websites for the evaluation were pooled by using two general search engines (Google and Yahoo!). The search terms were: 'dental caries', 'tooth decay' and 'tooth cavity'. Three assessment tools (LIDA, DISCERN and FRES) were used to evaluate the quality of the information in the areas of accessibility, usability, reliability and readability. Results: In total, 77 websites were analysed. The median scores of LIDA accessibility and usability were 45.0 and 8.0, respectively, which corresponded to a medium level of quality. The median reliability scores for LIDA (12.0) and DISCERN (20.0) both corresponded to low level of quality. The readability was high with the median FRES score 59.7. Conclusion: The websites on caries had good accessibility, usability and readability, while reliability of the information was poor. The LIDA instrument was found to be more convenient than DISCERN and can be recommended to lay people for quick quality assessment. Purpose: To determine the ability of 5 contemporary fluoride-releasing restoratives and 3 fluoride-releasing adhesives to inhibit enamel demineralisation surrounding restorations, and the associations between inhibition and the levels of fluoride released from these materials. Materials and Methods: Five fluoride-releasing restoratives (Fuji IX GP, Ketac N100, Dyract Extra, Beautifil II and Wave) and 3 fluoride-releasing adhesives (Stae, Prime & Bond NT and Fluoro Bond II) were investigated. Eight disks of each material were prepared. Fluoride release was measured daily using a fluoride-ion-selective electrode for 15 days. Twenty-four cavities for each group were restored with a restorative and an adhesive. Specimens were subjected to thermal stress and stored for 30 days in saline solution. After a 15-day pH-cycling regimen, two 150-μm-thick sections were derived from each specimen. Enamel lesion depth was measured at 0, 100, and 200 μm from each restoration's margin via polarised light microscopy. Results: Of the restoratives investigated, Fuji IX GP released the most fluoride. The fluoride-releasing restoratives tested exhibited shallower enamel lesions than did the control group at all distances tested (p < 0.05). Fuji IX GP yielded significantly lower enamel lesion depth than did the other experimental materials. The depths of enamel lesions did not differ significantly when comparing restoratives applied with a fluoride-releasing adhesive with those applied with a non-fluoride-releasing adhesive. Conclusion: The fluoride-releasing materials tested reduced enamel demineralisation but to different extents, depending on their levels of fluoride release. Fluoride-releasing adhesives did not influence enamel lesion formation.